One of my favorite chefs is Mario Batali since he cooks with a lot of passion and its just fun watching his shows and seeing him create different dishes that would really make you hungry. 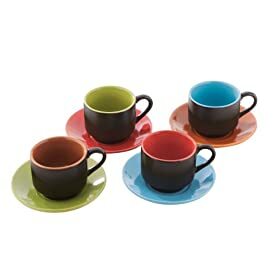 When I saw that he had his own mugs, a 4-set ceramic coffee mug and espresso cups, it had to be featured here. They look really simple, something the whole family would enjoy since you each can have your one color (yep, color coded). If you're five or more then dad gets to have a larger mug since reviews of this mug say that the mugs are smaller than they look in the picture but the mugs' size is still just right. If you find it too small, then just go for a second cup, which is what most of us do anyway. So we've already discussed the mugs, but some may not know who Mario Batali is. Here's an excerpt I got from his site. "Among his many accolades, Mario was named "Man of the Year" in the chef category by GQ Magazine in 1999. In 2002, he won the James Beard Foundation's "Best Chef: New York City" award and in 2005 the James Beard Foundation awarded Mario "Outstanding Chef of the Year." Mario is also one of the recipients of the 2001 D'Artagnan Cervena Who's Who of Food & Beverage in America, a prestigious lifetime achievement award." 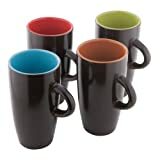 Enjoy coffee with these mugs! Surprise your guests with them or just use it for your family. Whatever you use them for you will for sure have a great day. Just be careful not to be too excited drinking very hot coffee or tea. I love those tall ones, just more stuff to add to my Food Network inspired kitchen collection.